Alberta maps from Omnimap, a leading international map store with 275,000 map titles. Alberta Hiking and Backroads Maps from GoTrekker. GoTrekker. These maps, all plot-on-demand, cover many of the beautiful back-country areas of Canada. The maps use symbols to loate sugggested routes, alternative routes, trails, restaurants, hoels, gas stations, campgrounds, and much more. Printed on paper unless noted otherwise. Sample detail from a small-scale map: 64-2776-1, Alberta Backroads Map #1. Sample page a 1:50,000 scale map: 64-2776-BAA Banff and Area. Sample page a 1:50,000 scale map: 64-2776-MA Mount Assiniboine . $14.95 64-2776-1 Alberta Backroads Map #1. Forestry Trunk Road from Waterton to Old Man River. 1:125,000. ISBN 9781926546902. $14.95 64-2776-2 Alberta Backroads Map #2. Forestry Trunk Road from Old Man River Forestry Road to Canmore. 1:125,000. ISBN 9781926546391. $14.95 64-2776-3 Alberta Backroads Map #3. Forestry Trunk Road from Ghost Dam to Peppers Lake. 1:125,000. ISBN 9781926546810. $14.95 64-2776-4 Alberta Backroads Map #4. Forestry Trunk Road from Peppers Lake to Fairfax Lake. 1:125,000. ISBN 9781926546803. $14.95 64-2776-5 Alberta Backroads Map #5. Forestry Trunk Road from Fairfax lake to Hinton. 1:125,000. ISBN 9781926546773. $13.95 64-2776-BAA Banff & Area Map. 1:50,000. 2013. With over 100 official Park trails. ISBN 9781926698427. $13.95 64-2776-BAC Banff & Canmore Area Map. 1:50,000. 2013. 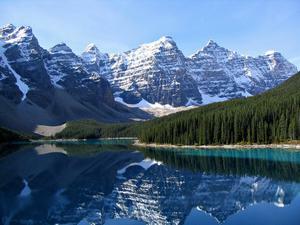 With over 70 official Banff & Kananaskis Park trails. ISBN 97819265456377. $13.95 64-2776-BAN Banff North and Ya Ha Tinda Ranch Area Map. 1:50,000. 2013. With over 20 official Park trails. ISBN 9781897482322. $13.95 64-2776-JA Jasper & Area Map. 1:50,000. 2013. Over 70 official Park trails. ISBN 9781926698502. $13.95 64-2776-JML Jasper & Maligne Lake Map. 1:125,000. 2014. ISBN 9781897482674. $12.95 64-2776-JMR Jasper & Mount Robson Map. 1:50,000. 2013. ISBN 9781926698519. $12.95 64-2776-JWM Jasper West & Miette Pass Map. 1:50,000. 2013. ISBN 9781926698526. $13.95 64-2776-KNE Kananaskis Northeast Map. Little Elbow Provincial Park to Barrier Lake to Bragg Creek. 1:40,000. 2012. ISBN 9781926698489. $13.95 64-2776-KNW Kananaskis Northwest Map. Fortress Mountains to Canmore. 1:40,000. 2013. ISBN 9781926698465. $13.95 64-2776-KSE Kananaskis Southeast Map. Little Elbow Provincial Park to Mist Creek to Sandy McNabb. 1:40,000. 2012. ISBN 9781926698472. $13.95 64-2776-KSW Kananaskis Southwest Map. Elk Lakes to Fortress Mountain and Peter Lougheed Provincial Park. 1:40,000. 2013. ISBN 9781926698458. $13.95 64-2776-LLA Lake Louise & Area Map (AB/BC). 1:50,000. 2012. With over 100 official Park trails. ISBN 9781926698441. $13.95 64-2776-LLN Lake Louise North Map. 1:50,000. 2012. With 30 official Park trails. ISBN 9781926546896. $12.95 64-2776-LLS Lake Louise & Skoki Area Map. 1:35,000. 2013. ISBN 9781926546179. $16.99 64-2776-MA Mount Assiniboine & Area Map. 1:50,000. 2013. ISBN 9781897482391. $13.95 64-2776-NS1 North Saskatchewan River Map #1. 1:50,000. Drayton Valley to Former Genessee Ferry. Designed for canoe, kayak, and floaters. No ISBN. $13.95 64-2776-NS2 North Saskatchewan River Map #2. 1:50,000. Former Genessee Ferry to Devon. Designed for canoe, kayak, and floaters. No ISBN. $13.95 64-2776-NS3 North Saskatchewan River Map #3. 1:50,000. Devon to Edmonton. Designed for canoe, kayak, and floaters. No ISBN. $13.95 64-2776-NS4 North Saskatchewan River Map #4. 1:50,000. Edmonton to Pakan. Designed for canoe, kayak, and floaters. No ISBN. $13.95 64-2776-NS5 North Saskatchewan River Map #5. 1:50,000. Pakan to Myrnam. Designed for canoe, kayak, and floaters. No ISBN. $13.95 64-2776-NS6 North Saskatchewan River Map #6. 1:50,000. Myrnam to Saskatchewan border. Designed for canoe, kayak, and floaters. No ISBN. $13.95 64-2776-PE Peyto - Wapta Area Map. 1:40,000. 2013. ISBN 9781926546186. $13.95 64-2776-TRG The Royal Group - Height of the Rockies Provincial Park Map. 1:50,000. 2013. ISBN 9781897482339. $13.95 64-2776-WAT Waterton National Park Map. 1:40,000. 2011. ISBN 9781926546957. $13.95 64-2776-WHA Whaleback & Bob Creek Wildland Map. 1:40,000. 2013. ISBN 9781926546827. $16.95 64-2776-WIL Willmore Wilderness Provincial Park Map (AB/BC). 1:125,000. 2013. ISBN 9781926546100. 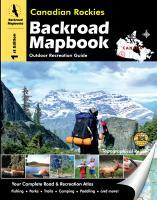 Canada Backroads Mapbooks. Topographic recreation road atlases. National Park Maps by GoTrekker. Many maps for the northern National Parks. Gem Trek hiking maps. Hiking/topo maps of Banff N.P., Jasper N.P., etc. Chrismar hiking and canoeing maps. Canada 1:50,000 Topographic Maps. Itemized topo lists, index maps, sample images. Canada 1:250,000 Topographic Maps. Itemized topo lists, index maps, sample images. Canada 1:500,000 VNC Aeronautical/topographic maps. Canada 1:1,000,000 WAC Aeronautical/topographic maps. Canada Railway Maps and Atlas. Canada & Provincial Geologic and Thematic Maps . 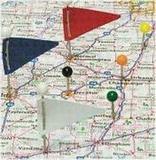 Map Pins, Map Tacks, Map Flags. Gifts for the Map Enthusiast.